I am in the promotional products business. This is a business where I have my client’s imprint (brand, logo, message) printed on a useful item such as a pen, koozie, coffee mug, flashlight, etc.. There are millions of items that I can have messages imprinted on. Years ago, my industry was called “goodwill advertising” then it was called “specialty advertising” and one genius in our association even had our industry renamed “Motivational Communications” That did not last very long. We are part of the MEDIA that businesses use to convey their message. It is called the world of Advertising. Advertising can be mass media; (message is broadcast to a wide variety of targets at the same time) this approach is SCATTERSHOOTING and is effective for products and services serving a WIDE audience (think consumer products, national banks, etc.). There is magazine advertising, billboard advertising and more… The goal of all Advertising no matter the media, is CREATING PREFERENCE for your product or service. The thing I love about my promotional products industry is that your message goes ONLY where you want it to go. Controlled circulation. No waste. Most of my clients are small businesses and KNOW who their clients are. If I do my job correctly and select the proper item, then the message goes to the target client and not only the message registers FREQUENTLY with the constant reuse of the item, but giant goodwill is generated. Promotional products can be moderate to expensive business gifts to key clientele, it can be used to motivate salespeople, and it can be used to stimulate dormant accounts. I also have a large footprint in the Awards and recognition business, as well as sales incentives programs. Here is an example of a well-chosen promotional program: I have a client that is a financial planner and her main target market is women. Not just women but single or divorced women that are over 40 years old and have, for one reason or another, not built up a nest egg for retirement. My client advises her clients to save, save, save. 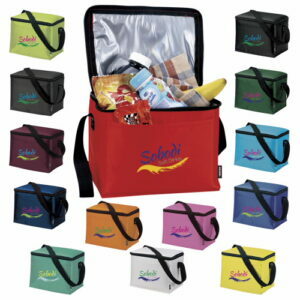 The Koozie Corporation makes an insulated “lunch box”. My client buys these and gives them to her clients reminding them how much they can save by bringing their lunch to work. When she gives them, she puts in a bottle of water and a few bananas. This has been very popular and has resulted in many referrals back to my client. Over the years I have seen the benefits of GIVING imprinted promotional products to your customers and prospects and I have seen the growth of those companies as compared to the business folks who just don’t want to spend the money. The more you give the more you get. I have seen the magic work too many times to doubt its veracity. If someone gives me something, I have a need to give something back. It’s a law of nature, the law of reciprocity. It’s the same way referral groups work. You give a lead or good referral to someone; they just have to give back. Please contact me if you want to put together a plan to create the magic in your clients.